Food Handler / Worker Card available online. Get your "Food Worker Card" online! It takes about an hour. The fee is $10. The class is available on the official "Tacoma – Pierce County Health Department" website. 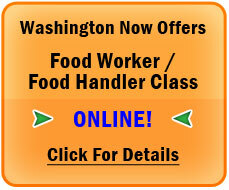 This link takes you directly to the page you need Washington State Online Food Worker Card. Ready to get your Alcohol Permit?